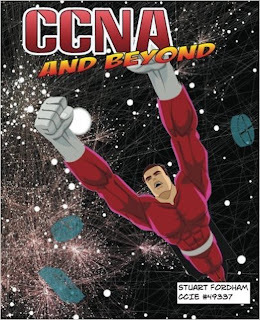 CCNA & Beyond book CCNA CCNA and Beyond - Beta testing/reading starts! I was so close to pressing the "publish" button, then decided to hold off. I am taking a new(ish) approach to this book, and am making it available to a limited group of people for testing. This is not a request for more people, just an update, and an explanation as to why it won't be published just yet. I am happy with the book as it stands at the moment, however, it makes sense to have a few people test it out before publication. I spent a long time over the last few days doing the little things to make it as perfect as I can. I have replaced a couple of tables with images (avoiding weird table flow across pages), lines are aligned to the top of the page better (because of an inherent issue with writing in Word, where paragraph breaks can mean that the first line of the next page is not at the top), correcting the flow, trying to make sure that output is not broken where one page ends and another begins), and generally trying to make it as polished as possible. I am rather proud of it, and felt ready to publish it. The first three books I wrote (the trilogy of BGP, MPLS and VPNs) was written for me and for a different audience. But this book is different. I am not the primary audience, so fresh eyes are needed. I posted a Reddit thread asking for volunteers, and had a great response. So, the proof copies are ordered and on their way to me. These will then be shipped around the country, and these kind people can test the book. This means though, that the release date will be later than originally intended. It should (hopefully) be released towards the end of February/beginning of March.